Swatch: Missha BB Cream Comparison | Memorable Days : Beauty Blog - Korean Beauty, European, American Product Reviews. I have been using Missha BB creams longer than a year now and I'm still loving it ^__^. 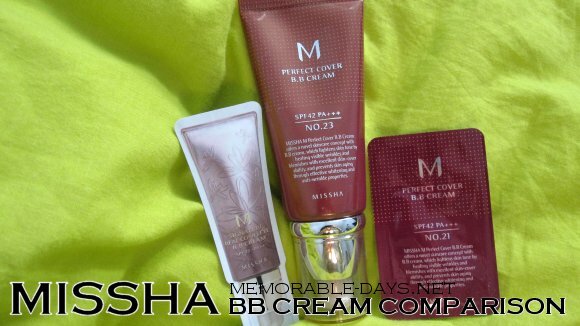 This is my review of the Missha M Perfect Cover BB Cream which I posted last year. A while ago Suzy gave me a sample of the Missha M Perfect Cover BB Cream #21 and the M Signature Real Complete BB cream #23. I had never tried the M signature BB cream before so I was curious what the difference was compared to the M Perfect Cover. I used to use the M Perfect Cover #23 all the time, but my skin tone turned whiter because of the winter >.<" (my face is a bit pale/yellowish atm), so #21 matches my skin tone more now. I'm going to use #23 during the summer again ^__^. M Perfect Cover BB Cream gives an even and natural-looking coverage with the soothing, moisturizing properties of a cream. It is suitable for all skin types including acne-prone skin, and can be used as a makeup base or foundation. It has whitening, anti-wrinkle and UV protection (SPF 42 PA+++). The M Signature Real Complete BB Cream is a multi-function BB cream with perfect coverage, good adherence and long lasting effect. It's from the luxurious line of Missha that contains Skin lipid. It also has UV protection SPF 25 / PA++ , anti-wrinkle and brightening effect. It looks like this in daylight, as you can see M Perfect Cover #21 matches my skin tone the most. According to the packaging this color is light beige. 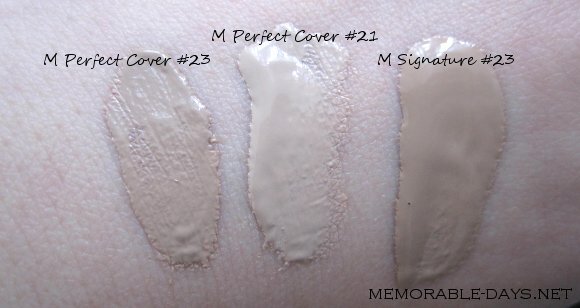 M Perfect Cover #23 is natural beige and the Signature #23 is natural yellow/beige. They all have a grey undertone but the Signature #23 looks orange on my face =.=". It has a pretty packaging, easy to use and hygienic ^__^. These BB Creams comes in a squeeze tube with a hygienic pump dispenser. When you can't pump the BB cream out anymore I advise you to cut the tube open. I'm sure that there is still heaps of BB cream inside the squeeze tube, so cut it open and put the left over BB cream in a small tin. The texture of the Perfect Cover #21 and #23 is creamy while the texture of the Signature BB cream is more liquid. The Signature BB cream has more coverage (medium-full) than the Perfect Cover one (medium). These products have a light pleasant scent of a floral hand cream, but I like the scent of Perfect Cover more than the Signature BB cream. All BB creams are easy to build up and you will only need a small amount of the product. 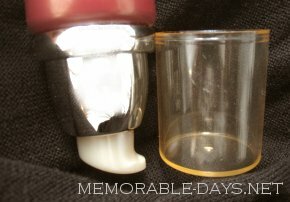 Perfect Cover comes in a tube of 50ml for 29.99 USD and has 4 shades and the Signature comes in a tube of 45g for 45 USD and has 3 shades. These prices are from the Missha USA website. I'm sure of it that you can find cheaper ones on Ebay :). These BB creams are all very good ^__^. However if I had to choose between the M Perfect cover #23 and the Signature #23, I would choose Perfect Cover cause it matches my skin more during summer, the scent is more pleasant, has a higher SPF, I like the texture more and I don't need much coverage on my face (medium is enough). I just don't like the color of the #23 Signature BB cream cause it's orange on my skin x_x". Which BB Creams do you recommend?